WHAT: When Russian immigrant Jupiter Jones (Mila Kunis) discovers that she’s the reincarnation of intergalactic royalty, she becomes the target of a power play between her former self’s three feuding siblings, who all want her for their own selfish reasons. 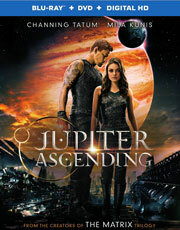 Saved by a disgraced solider named Caine (Channing Tatum), Jupiter must take control of her destiny if she hopes to save Earth from its terrible fate. WHY: It’s been 16 years since “The Matrix,” but you wouldn’t know it from the amount of money Warner Bros. continues to flush down the toilet with Andy and Lana Wachowski’s string of commercial and critical failures. “Cloud Atlas” should have been the final straw, but instead, the studio took yet another chance on the directing duo with “Jupiter Ascending,” and although the Wachowskis’ commitment to creating original sci-fi stories is commendable, it’s their worst movie to date. A garbled mess of half-baked ideas (some good, some bad) that never have the chance to fully develop due to an overwhelming mythology that delivers too much information, too quickly over the course of its 127-minute runtime, “Jupiter Ascending” was a disaster waiting to happen. It wouldn’t surprise me if a much longer cut of this movie existed, because the current version feels like it’s been chopped up and pieced back together to include all the essential material without any consideration for how it works as a whole. But that’s just the tip of the iceberg. The film is also plagued by poor attempts at humor and some truly awful performances, none more so than Eddie Redmayne as the eldest of the royal siblings. Despite some impressive visual effects, “Jupiter Ascending” is groan-inducingly bad – a massive swing-and-miss that could spell the end of the Wachowskis’ charmed partnership with Warner Bros.
EXTRAS: The Blu-ray release contains seven featurettes covering a variety of topics, including production and creature design, filming the action sequences, as well profiles on the Wachowskis and the movie’s lead characters. WHAT: Veteran conman Nicky (Will Smith) agrees to help coach a promising grifter named Jess (Margot Robbie) when he brings her in on his large-scale operation. After Jess gets burned by Nicky at the end of the job, the two go their separate ways until they cross paths again three years later when Nicky is hired by a wealthy racing team owner (Rodrigo Santoro) to help ruin his competitors. But while Nicky wants to make amends after the way he left things, Jess is unable to trust him, convinced that he must be working some kind of angle. The real question is whether Jess is too. WHY: Films about con artists are almost as difficult to pull off as an actual con. They need to be clever enough to outsmart and entertain the audience without being overly complex or resorting to narrative cheats. 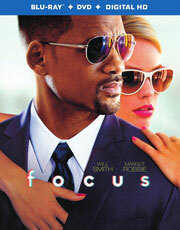 “Focus” is definitely entertaining at times, a flashy crime drama highlighted by a pair of movie star performances from Will Smith and Margot Robbie, but it also commits the aforementioned offenses in order to arrive at its twist ending. However, that’s not the film’s biggest problem, but rather the fact that “Focus” is basically two movie stitched together by the same connective tissue, and only one of the halves is any good. While the first half is a fun and fizzy con movie that’s capped off by a terrifically tense sequence featuring BD Wong as a high-stakes gambler, the second half isn’t nearly as engaging, partly because Smith and Robbie don’t have strong enough chemistry to sell the romance at the center of the story. The script’s playful tone remains intact throughout, but it never quite clicks the same way, bogged down by scene after scene of exposition that’s all setup for the big payoff. Although it’s refreshing to see a major studio take a gamble on a modestly budgeted film targeted towards adults, “Focus” is so passively mediocre that you can understand why other studios have been afraid to pull the trigger. EXTRAS: In addition to a featurette about the art of misdirection, there are profiles on Will Smith and Margot Robbie, as well deleted scenes and an alternate opening. WHAT: After an incident at his old job results in his firing, high school football coach Jim White (Kevin Costner) and his family move to the small, predominantly Latino town of McFarland, California. Though it’s the only teaching position he could find, Jim makes the most of the opportunity when he notices that some of the boys are exceptional runners, which when combined with the work ethic instilled upon them by their parents, has all the makings of a winning cross country team. 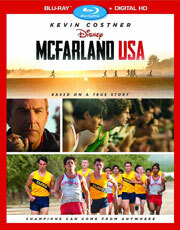 WHY: Proving that there aren’t many sports out there worse than cross country to make a movie about (and this is coming from someone who ran on his school team for four years), “McFarland, USA” takes the clichéd “white savior” motif and injects just enough emotion into it to avoid being racist. That’s not to say that it’s completely innocent, however, as the movie spends quite a bit of time devoted to Jim’s realization that Latinos are decent people too, which smacks of so much ignorance that it nearly pulls you out of the film. Thankfully, most of those moments take place early enough in the movie that it eventually redeems itself, even if you’re forced to sit through all the usual beats of Disney sports drama in order to get there. Kevin Costner could play this role in his sleep, and Maria Bello isn’t given enough to do to justify her involvement as his supportive wife, but it’s the young cast of mostly unknown Latino actors who provide the beating heart of “McFarland, USA.” It’s way too long at 129 minutes, but like most films in the subgenre, it satisfies that feel-good itch without straying too far outside its comfort zone. EXTRAS: There’s a retrospective about the real-life events that inspired the film with Kevin Costner, Coach Jim White and members of the 1987 cross-country team, as well as a short featurette about the town of McFarland and some deleted scenes.